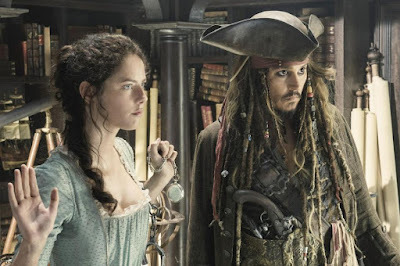 Carina (Kaya Scodelario) and Capt. 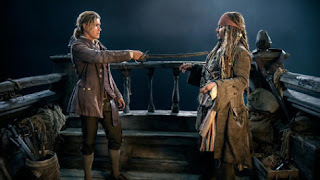 Jack Sparrow (Johnny Depp) are compelled to execute an escape to pursue a treasure in “Pirates of the Caribbean: Dead Men Tell No Tales.” Photo courtesy of Walt Disney Pictures. IF you had in your hands the means to rid the world of all evil, would you use it to do so? Most would. And so it is in “Pirates of the Caribbean: Dead Men Tell No Tales.” The film, which opens in U.S. theaters today, is the fifth in the “Pirates of the Caribbean” franchise. Of course, Johnny Depp is back as the ever flighty, ever feckless, often self-serving, but ultimately harmless Capt. Jack Sparrow. At the center of the fantastical "POTC: Dead Men Tell No Tales" is the Trident of Poseidon. Henry Turner (Brenton Thwaites), the son of Will - Orlando Bloom back in a cameo role after his absence from "POC: On Stranger Tides" - unleashes the talisman, ridding the seas of all curses. That includes freeing his father from his confinement on the Flying Dutchman, plus sending some disembodied, revenge-seeking pirate hunters led by Capt. Armando Salazar (Javier Bardem) back from whence they came. The aforesaid is not a spoiler, for the real revelations and the real story - the most coherent one since the original "POC: Curse of The Black Pearl" - are in the chase for the Trident. Along the way new characters are introduced into "POC: Dead Men Tell No Tales." JB's dementedly determined Capt. Salazar and Henry are two. Another is a luminous (Kaya Scodelario) as orphan Carina Smyth. She faces the hangman's noose for witchcraft, owing to her unnatural and unseemly knowledge of astronomy and horology. And Carina has a surprising connection to the Trident. Carina and Will are no doubt the new generation of young lovers, primed to replace OB's Will and (Keira Knightley), who also returns in a cameo, as Elizabeth Swann Turner. The former will make an interesting pair. BT resembles OB and has some swagger in his swashbuckle. No mere eye candy, KS is as smart as a whip. She is also capable. Where KK's Elizabeth was more the damsel, KS as Carina is a dame. A critical-thinking force to be reckoned with. Meanwhile, once it becomes apparent to all and sundry the power that the Trident possesses - to rule the seas and by extension, the world - the pursuit and swashbuckling, aided by some dazzling digital effects (parted seas, for instance) albeit, occasionally excessive in the extreme, begin. The contestants in the great race for this booty: Capt. Jack, Will, Carina, Capt. Salazar&Co., the British navy and Geoffrey Rush's Capt. 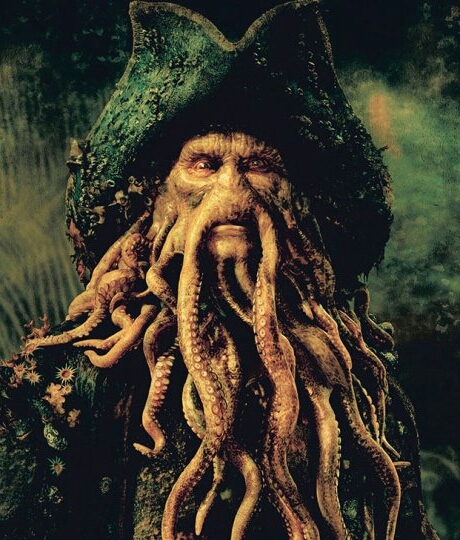 Hector Barbossa. Except for the navy, allegiances sometime change as quickly as the winds shift. Capt. 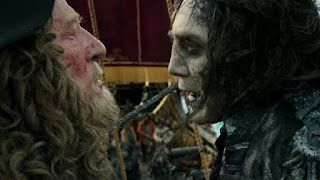 Barbossa (Geoffrey Rush) accepts an offer he can't refuse from Capt. Salazar (Javier Bardem). "POTC: The Curse of the Black Pearl" was released in 2003. By now, the recurring players, particularly JD and GR, are as familiar as family. We accept them, their peccadiloes notwithstanding. Still, directors' Joachim Rønning and Espen Sandberg's "POTC: Dead Men Tell No Tales" suffers from slow pacing, among other plagues. It seems closer to 2 1/2 hours but is actually 129 minutes. There is a heavy hand with the aforesaid digital effects as well as some of the action sequences. The bank robbery scene has promise, until it does not. It could have been pared significantly. Also, an opportunity in Jeff Nathanson's script is lost in not giving Carina - the most engaging addition to the series since its inception - a backstory told in flashback. It would have been a tender break from the noise. Elsewhere, JD's Capt. Jack shtick is beginning to show wear and tear, though it still has some appeal. At moments however, JD seems to be simply going through the motions. His eyes, and perhaps his heart, appear not to be in it. On the otherhand, the technology used to de-age him - in support of Capt. Salazar's backstory - presents a young Jack Sparrow deftly exhibiting the physical and facial ticks that are now classic Jack Sparrow. As Capt. Salazar, JB is engagingly ferocious and will likely show up in a future "POTC." Similarly, GR is in fine form as Capt. 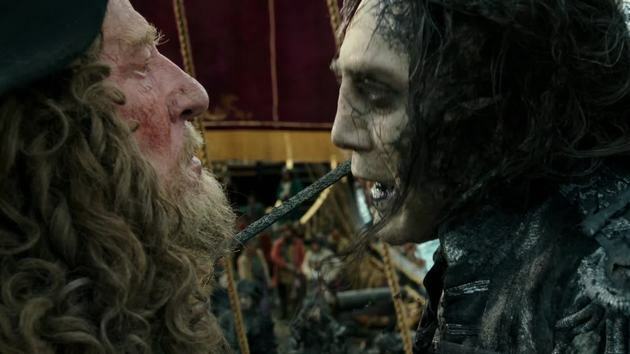 Barbossa and may be back, though "POTC: Dead Men Tell No Tales" would have viewers believe that he is the occupant of a watery grave. Speaking of dead men, the specter of Davy Jones haunts this film. To that end, fans can expect that resurrection in a future "POTC." Henry Turner (Brenton Thwaites) makes cutting remarks to Capt. Jack Sparrow (Johnny Depp). For now, there is "POTC: Dead Men Tell No Tales." Its shortcomings threaten to sink it but it manages to stay afloat on the force of familiarity and winsome charm.